Introduction to flannel board: Let's see what happens when you fill the tub with water. What might we see in the bathtub? Each line starts with "Fill the tub with water, what do you see?" Let's say that together. . . . Good! Fill the tub with water, what do you see? I see bubbles floating in the bathtub sea. Fill the tub with water, what do you see? I see a washcloth floating in the bathtub sea. Fill the tub with water, what do you see? I see a cake of soap floating in the bathtub sea. Fill the tub with water, what do you see? I see a shampoo bottle floating in the bathtub sea. Fill the tub with water, what do you see? I see a little boat floating in the bathtub sea. Fill the tub with water, what do you see? I see a pouring cup floating in the bathtub sea. Fill the tub with water, what do you see? I see a toy shark floating in the bathtub sea. Fill the tub with water, what do you see? I see some swim goggles floating in the bathtub sea. Fill the tub with water, what do you see? I see a watering can floating in the bathtub sea. Fill the tub with water, what do you see? I see a rubber ducky floating in the bathtub sea. Fill the tub with water, what do you see? I see a nice clean baby splashing in the bathtub sea. Early Literacy Aside--Empower: Even when you are giving your children a bath, naming the objects, describing them, talking about floating and sinking, heavy and light, as they play with toys in the bath; these are good ways to expand their knowledge and vocabulary which will later help them understand what they read. 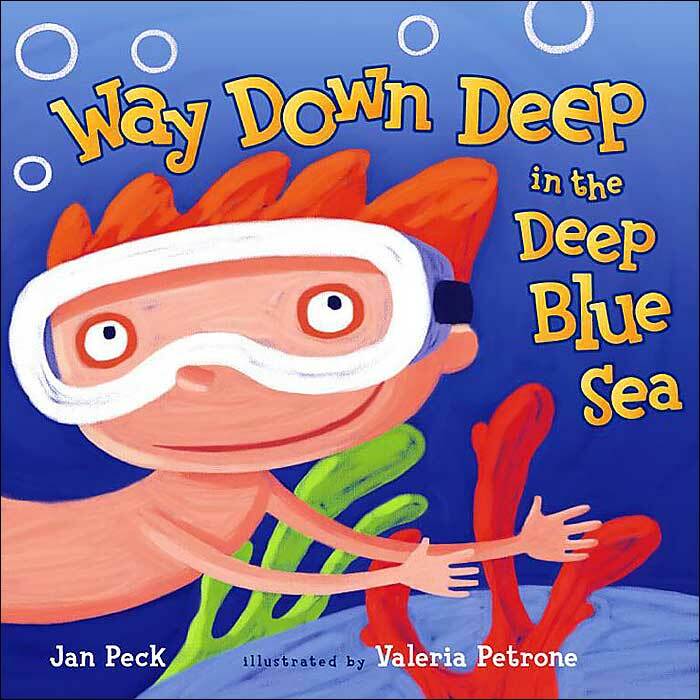 Introduction: I am going to read our next book, Way Down Deep in the Deep Blue Sea by Jan Peck. Then you can tell it with me on the flannel board.Read Way Down Deep in the Deep Blue Sea. Repeat some of the rhymes to help them remember. 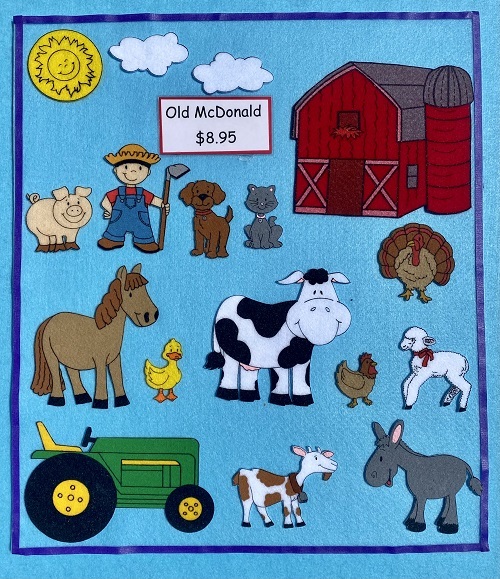 Flannel Board: As you put up pieces on the flannel board have the children retell the story. Early Literacy Aside--Example: Using the flannel board pieces as a clue will help your child remember the story to retell it. Encouraging your children to retell stories helps them to both remember and to understand them. It is a first step in helping them to later understand what they will read. Song: The Bear Went Over the MountainThe bear went over the mountain, the bear went over the mountain The bear went over the mountain, to see what he could see. And what do you think he saw? And what do you think he saw? He saw a goat in a boat, he saw a goat in a boat. He saw a goat in a boat, That is what he saw. Early Litearcy Aside--Example: Rhyming is an important part of phonological awareness. It helps children break down words into smaller sounds and identify similar sounds in different words.This skill will help them when they sound out words to learn to read. Re-sing the song putting up different felt figures (skunk in a trunk) and allow the children to tell you what they see. Read the book Blue Sea by Robert Kalan. Use the flannel board to retell the story. You put up the pieces and have the participants retell the story as you put up the pieces. You may say a few words to prompt them. Early Literacy Aside--Example: Giving children an aid, like the flannel board pieces, helps them remember the story and the order. This helps them develop their narrative skills which both helps them later understand what they will read and helps them understand how stories work. Early Literacy Aside--Empower: Today I have a handout for Blue Sea for you. You and your children can color and cut out the pieces and then retell the story together. Remember that telling stories will help children later in school when they have to write their own stories.